I'm sitting inside T.G.I. Friday's, getting full off a salad and mozzarella sticks and tipsy from my beer. Even indoors, it's a scorching Saturday afternoon; the usual strange weather we've been experiencing as of late. Vern and I are waiting on Raleene. We've never met her before, but based on her blog, she's got the presence that demands a double take. "Hey, it's Rihanna," my mom says. Actually, it's Raleene. "I want to stress that my blog is not mainly about fashion. I consider myself a lifestyle blogger." Scrolling through her blog, Raleene.com, you'll find that 95% of her posts are about food, events, daily life, work, architecture and design... Not her outfits. "That's why I have Chictopia and LookBook... My blog is my diary. I blog for myself. I love looking back at old entries and sometimes I literally laugh out loud. I try not to blog anything negative." "I never smile in pictures." What a shame, I think. Her face lights up when she laughs, breaking the dark aura of her natural features that are all lines, corners and shadows. This girl is all high contrast. Case in point, she tells us of a time when she had "hair that was up to [her] knees." Her friends all told her that cutting her hair would be a waste of all the time she's spent growing the flowing locks. "..But once I lost weight, I cut it." As my vision slowly steadies, we wrap up the conversation and head outside to shoot. True to character, even a smirk won't escape her lips as we shoot around High Street. What could have been an hour of, 'try this pose' and 'work with that light' was five minutes or less of non-stop camera snaps. Black t-shirt to match the hair that matches the attitude. Edgy, dark, unpredictable. I can't put my finger on who this girl is and who she's trying to be.. Is that the point? Raleene, who is half of the up-and-coming band, The Walkie Talkies, is also a photographer, model, ambassador for Powersnet ("a social networking style site"), is extremely active in her church, Church Simplified, and runs an extremely successful lifestyle blog, Raleene.com. 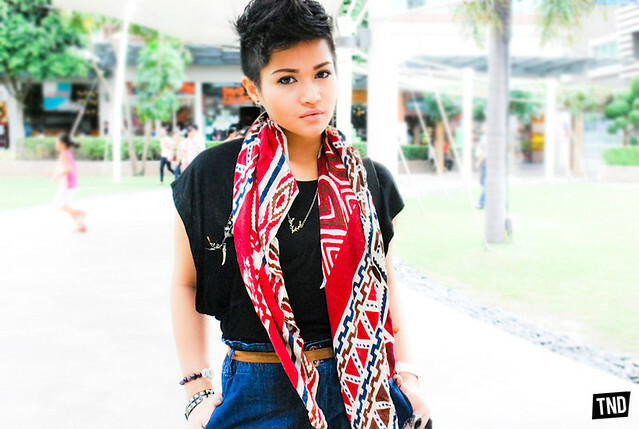 She can also be found on Facebook, Twitter, Tumblr, YouTube,Lookbook, Chictopia, Dailybooth, Flickr, Multiply and DeviantArt. Thanks to The New Department for featuring me in your blog! Check out their newly-launched site, guys!